The Vault House designed by architecture firm Johnston Marklee in Oxnard, California. One half of the Los Angeles-based architecture firm Johnston Marklee, Harvard’s newly appointed chair of the Graduate School of Design moves fluidly between the academy and the city. Mark Lee shares his thoughts on the future of the school, the relationship between principle and practice, and his firm’s recently completed Menil Drawing Institute in Houston with fellow architect Andrew Heid. Andrew Heid: As the new chair of the architecture department at Harvard’s Graduate School of Design, you’re very much embedded in the professional academic culture of architecture. What differentiates and connects your projects to your practice? Mark Lee: There’s certainly a difference between the project we have in our office and the project we have at school. At school you are with a group of colleagues with very different agendas, and the pedagogy is very different from one’s own practice. I try to separate that. In terms of our firm, Johnston Marklee, we have always believed in the everyday building as the fabric of the city. I think throughout my and Sharon’s [Johnston] education there has always been a focus on iconic buildings—the one percent of buildings that would change the world. In contrast, we have noticed that the quality of everyday architecture in most cities is declining; it’s in the hands of the developers. If we believe in architecture as a discipline and a medium, in order for that architecture to regain its power, the quality of 99 percent of everyday architecture has to raise. We strive to adhere to that in our practice. We try to have a certain agenda based on the specificity of the project while staying rooted in history and the physical context of the city. In many ways I think we have a more European attitude about the city, for instance, thinking about the building as one of many components. AH: A set piece as opposed to an object in the city. ML: Correct. There’s not a formula that we adhere to. Sometimes you get the subject of the buildings in the context, but sometimes the context is nothing and your future building is the context. Understanding which direction to take for each project is important for us. AH: You mentioned a European sense of building. Was that influence from your teachers at the GSD? ML: Sharon and I met at Herzog & de Meuron’s studio at the GSD. They were important mentors and teachers for us. At that time they were very different from anyone else. On the surface, their work seems minimal and restrained, but there is this extreme intensity about their work. 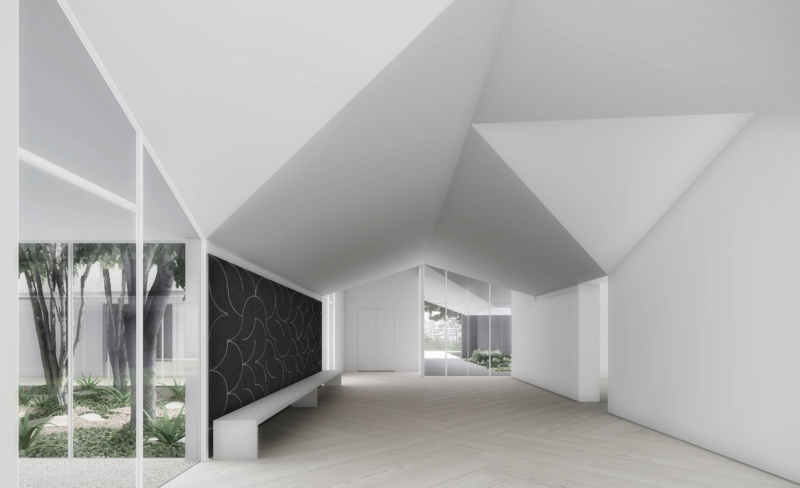 A rendering of the Menil Drawing Institute’s interior. AH: How did that trickle down from their studio into your work? ML: After we studied with them, I spent a few years in Switzerland as a teacher. I learned the strength of Rossi and why he was important at that time, which was when Lucius Burckhardt was an important sociologist and very powerful within the architecture circle. Burckhardt’s message was that you can do anything except architecture; architecture was really vilified. When Rossi said there’s nothing but architecture, it was very refreshing. It was like a pendulum swinging in the opposite direction. We understand Rossi’s attraction, but we also understand his sense of typology works within a more Italian or Lombardian sensibility that was perhaps not in line with the opportunity given to Herzog & de Meuron and the generations of Swiss architects after them when Switzerland was developing these new agglomerations or suburbs, many of which fused [Robert] Venturi’s Complexity and Contradiction with Rossi. AH: There is no context in these Swiss suburbs, just like there’s no context in Las Vegas. ML: Exactly. Or the context is the gas stations, the signage, an embracing of banality. You can almost imagine Venturi’s buildings without the symbolism—that mannered way of dealing with modernism actually worked very well with the Swiss vibe. Although Rossi’s influence was more a part of this official culture, I think Venturi also plays an important role. AH: You have addressed context and typology in your work, but how does the aesthetic notion of your work play out? ML: I think one of Ed Ruscha’s famous quotes was when he was asked what type of response he would like to solicit from his audience and he said he wanted them to say “Huh?” and “Wow.” That really resonated with us, and we understand it as defamiliarization as a prelude to cognition and delight. We desire our work to be less loud. We want our buildings to have a sense of mystery. AH: I’m always drawn to this idea of the project behind the project, or the intractable problems of the discipline that architects confront. How would you describe the Menil Drawing Institute as addressing disciplinary questions, circulation, envelope, transparency, façade or materiality? ML: We wanted to address the boundaries of architecture. In school we were taught to dissolve boundaries, but after we left school, we asked ourselves what architecture does best: it’s actually building boundaries. As a result, our work always has a definitive profile. 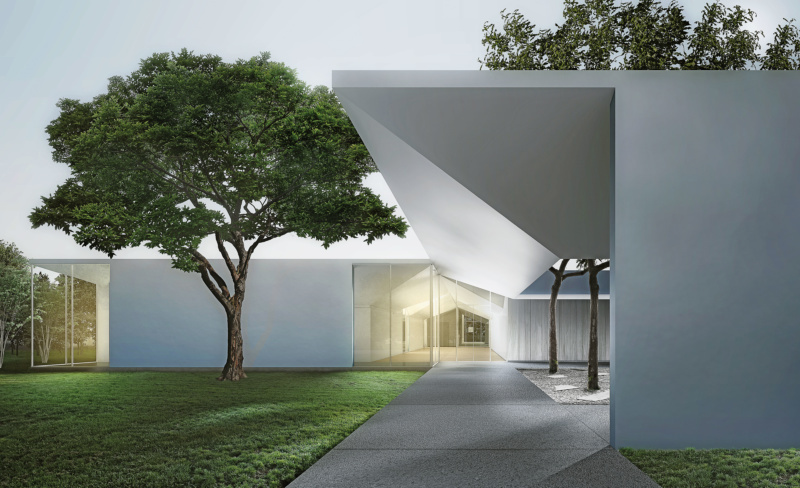 The new Menil Drawing Institute faces a future sculpture park. We wanted the scale to be somewhere between the pre- war houses and the Twombly gallery and wanted a timeless feeling, so a new visitor to the campus won’t be sure whether it was built before or after the Twombly. That’s part of the essence of the place we want to preserve. We chose a really hard boundary facing the sculpture park; it’s the future southern entrance to the campus, so the building has a certain confidence and definitive aspect. But on the east, west and northern sides, as it approaches the residential neighborhood and different landscapes, it’s much more broken down. When entering the building, you always enter a courtyard first, which is barely defined by a few walls and a porch with landscape in the middle. It belongs to the building as well as to the garden and the outdoor space. It’s a kind of in-between place. Because the Menil Drawing Institute houses light-sensitive works, the architects focused on the transition of light between the exterior and interior. It acts as a transition not only between architecture and landscape, but as a space that is shaded by existing trees to adjust one’s eye before you enter the building, because the Drawing Institute is dedicated to works on paper with very sensitive lighting requirements. We didn’t want a manmade effect going into a very dark space from a bright space. The sequence of walking in, from the outside to the inside, gradually diminishes the amount of brightness. It doesn’t feel like a bright space because your eyes have enough time to adjust. This was one of the biggest issues we dealt with. Another is the typology of the building. We did a lot of analysis of the campus before we started designing. We noticed a liturgical aspect to the buildings: the Rothko Chapel, the Byzantine chapel, the central space of the main Menil Collection building has a nave-like quality, and the Dan Flavin installation has a broader space. There’s also the history of the Menils. She was a Protestant, he was Catholic and they supported the church, civil rights and social justice. So we felt that the liturgical feeling would work well for the Drawing Institute. We looked at a lot of monasteries and cloisters to inform the courtyards. In some monastic cultures there are two courtyards—one for the nuns to intermingle with the public and one inner courtyard that the public is not allowed to access. Similarly, there are two courtyards outside and one that the public has only visual access to. It really serves the people that work there as well as visiting scholars. Architecture is a very slow art. It’s best when you give it time and presence. AH: For me, the courtyards break down the separation of public and private space in a very powerful way that blurs the boundary between inside and outside landscape. That again answers these intractable problems of architecture. On the one hand it creates this strong boundary, and on the other hand it’s actually dematerializing it with the garden and courtyard. Going back to the question of the project of the practice versus the project in the academy, I wonder if you could talk about your project in the academy in critical terms. How does one translate the academic conversation of criticism more generally to educate and expand the audience? ML: Academia is a place for discourse and discussions. I like the model of the Enlightenment, where there is a certain decorum, but once you have that you can be very open-minded about sharing if you agree or disagree. It is important not to take it personally. Oftentimes, discussions become so vicious and forensic—arguing to win an argument. But architecture is a collective practice. Even with decisions I don’t agree with I treat my colleagues with respect, and this ethos is important for the academy. Once we have the base we can have a discussion. AH: What do you think are the different trajectories at the GSD right now, and how will you insert yourself or inflect those trajectories? ML: I think there are many different trajectories. It’s a large school, so there are many directions and generations—certainly a very optimistic one that was exposed to computer-generated design when it was very new, and a later generation that sees it as something more ubiquitous. They see the problems but lack that overconfidence that it alone can change the world. I think it’s important to have the extremes, but the important thing is to cultivate discourse and discussion. We want the students to make their own decisions and not to be acolytes or followers. AH: So besides the project of liberalism and openness, do you see yourself bringing an agenda to the GSD? ML: I certainly do. I want to emphasize the importance of building. I am a product of my beliefs, my time and my background. I was trained at a time when architecture could be the answer to any problem. Architecture can engage any issue in cultural study. In hindsight, there are some issues that architecture might not answer, and if you want to do this you should be a filmmaker or a software designer. I’m not interested in asking what is the problem, but what can architecture contribute best to that problem? Oftentimes in the past, in academia, architecture is treated like a trash can. Whatever problem is out there is thrown to architecture. I think it’s important to define the limits of what it can do. But we have to first ask what architecture cannot do. We cannot solve world hunger, but we can contribute in a smaller way. Understanding the perimeter actually helps liberate architecture to focus on what it should do best. Mastering the understanding of the built environment is important—something I would like to continue to focus on in school. AH: What about criticism today? How does one educate the general public regarding architecture? How can we create a more critical, enlightened public? 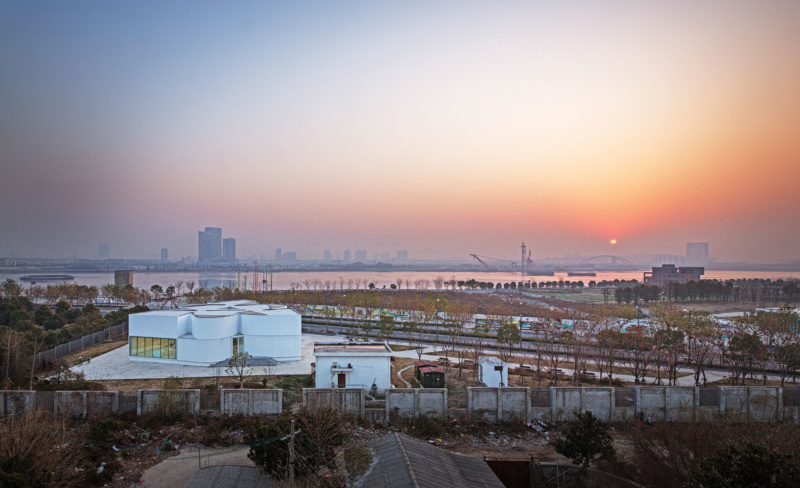 The Pavilion of Six Views in Shanghai, China designed by Johnson Marklee. ML: To put it very simply, there are critics that write for the general public and there are critics that write for architects and other critics. These two realms need to be closer together. Certainly in the first example the critic has a role, the responsibility of deciphering architecture for the general public and understanding the interest of the general public. The latter, which is a bit more specific and inside baseball—it just serves its own purpose. It becomes this feedback loop with no way out. I think one of my models is Adolf Loos, who wrote in such a simple way but with a lot of erudition. He wasn’t trying to be indecipherable, to close off the general public. It has a certain democratic way that I aspire to. AH: How do you balance your professional practice and your academic project? ML: Not to sound pessimistic, but in the context that we practice, architects have very little power. Within the academy you can come up with a program at the tail end of a much larger bureaucratic process, where much has been decided and you are hired to give it form. I think one or two generations before us believed in a certain type of posture of resistance. In my generation, even speaking for a younger generation, maybe we see that early form of resistance translated into form is purely rhetorical. ML: Correct. There is not really a modernist, avant-garde model. For architects to be transgressive we have to take more of a Trojan Horse approach and find a way to do something else within that structure. It’s a very subtle way of doing it.